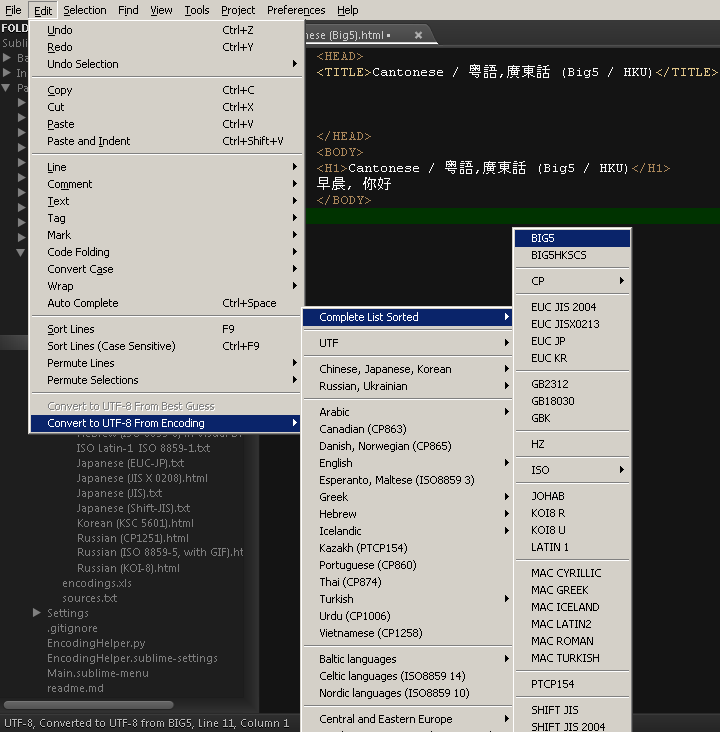 Convert to UTF-8 from a variete of encodings organized in a menu. Thanks for this, I working with Windows MAC and Linux files and a good encoding controll is important! Unfortunately I have a Problem on minimized Files, for example the jew jquery “jquery-1.7.min.js” if I open it in sublime2 no encoding is shown in the status bar. Other Files work like a charm. Is not a problem with minimized files, is because guessing an encoding is an expensive task. On my computer takes 8 seconds to guess the encoding for a jquery.js file. This packages has been updated with minor tweaks and a new feature. Sublime text provides API call view.encoding(). There is a bug with this API. Sometimes on the “on_load” event, view.encoding() is ‘Undefined’, probably because the event is dispatched before the encoding is detected. Could you please make another one with just one function - show encoding of the file in the status bar (near Syntax field)? You can just set show_encoding_on_status_bar to true and forget everything else. It seems that since my “fallback_encodings” list in the default settings was empty, python didn’t like it. Now it works. Is this unexplained step expected, or did I miss something? Mmm I can’t reproduce your problem. Can you please remove and reinstall the package, restart sublime to see if the problem still hapens? Maybe there was a syntax error or something into the file you had before. Display an alert when the line_ending is not some you expect. I started looking into doing this myself but thought it would be better putting it into this plugin. So every time I open a file which is none of those encodings I get an alert message, would be great. 1.] DOES IT WORK ? how precise it is, does it work only sometimes when in official settings is this comment ? is there anywhere manual action simply and only … Convert to UTF-8 ? is there any feature like this ? To convert a document from some encoding to the other, go to “edit” -> “Convert to uft8 from” and select the encoding. That message is not from this plugin. Is this plugin work with ST3? I can’t get the encoding to show up in the status bar. I can see it’s set to “true” in the default settings but it doesn’t show up. I used the repository url for the ST3 branch (github.com/SublimeText/EncodingHelper.git). I’ve had problems with this (very valuable!) plugin and the only way I got it to work with ST3 is to make some pretty significant edits to the chardet library, using http://www.diveinto.org/python3/case-study-porting-chardet-to-python-3.html and a handful of edits to EncodingHelper.py. The only problem I am having now is that it doesn’t seem to be activated until I reload the plugin (by re-saving EncodingHelper.py) while Sublime is running. Does anyone have any idea why the plugin isn’t active unless it is reloaded? The branch st3 is the correct version for ST3.